You are here: Home / 2015 / It’s Monday, What are you Reading? Growing up in the 80s and 90s it was hard not to read books by R.L. Stine. If you were a kid, you had Goosebumps, and if you were a pre-teen or a teen, you had Fear Street. Enjoying the latter so much (while my little brothers read a little of the other series), I was ecstatic to hear Stine was revisiting the street I had spent so much time reading about as a teen, and I jumped at the chance to read an advanced copy in exchange for my honest review. Rachel is invited to the popular Fear Island for a sleepover birthday party. Even if a bad dream the night before (and a dead rat in her bed) scares her, Rachel needs to go—after all, it’s the first time her crush, Brendan Fear, has acted like he sees her. When they get to the island as a group, Brendan admits his crush to her, and they all settle in for a nice dinner before the games begin. And, definitely, these are games! Rachel finds herself paired up with Brendan in a spooky scavenger hunt. What starts off as a game takes a sinister turn as the bodies begin to pile up. And the whole party turns into something much more dangerous. I was really happy to read this book, it felt like a stroll down memory lane, Fear Street style. Rachel is the epitome of an RL Stine heroine. She is a convincing teen, with enough common sense to keep her alive throughout the night. While I grew up with these archetypes, I wonder if girls growing up with Twilight would be able to survive something like this, or maybe be inspired by this. I would like to think that this book could survive the brutal youth market and makes it way past the current heroines of contemporary novels. It is available at your favorite retailer now, as it came out in Fall of 2014. Pick up a copy today to revisit your past. 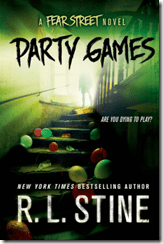 You can even check out Stine’s favorite Fear Street books on his website, via this link. I can honestly say I remember reading all of these, and definitely agree with him on most of these books!